One doesn’t even have to introduce Thunderbird. It’s the most famous open source email client. It was created by the split of the Mozilla suite into a browser (Firefox) and email client (Thunderbird). In 2012, Mozilla handed over the development to the community. At the end of 2014, Mozilla announced they would decouple development of Thunderbird from Firefox to focus more on browser development. A lot of users understood this announcement as abandoning Thunderbird completely, but that’s not the case. Who is it for? A general purpose app that works well in all desktop environments. You’ll like it especially if you need to work on several OSes. Thunderbird does the job for me. It could be easier and more beautiful. It also has quite a few rough edges I needed to get used to; some I was able to work around by adjusting the configuration or by using extensions. But in the end Thunderbird suits my needs better than all the other clients I looked at in the recent past. Thunderbird for example handles multiple identities properly (with the help from the extension “Folder Account”), which is quite important to me. By using the extension “QuickFolders” I can quickly navigate between all my important IMAP folders. Enigmail, just like Thunderbird, could need some polish, but it handles PGP fine. In the end I’m not completely satisfied with Thunderbird, but it most of the time just works; that’s important to me, as I handle hundreds of mails every day. Evolution also doesn’t have to be introduced to Linux users. It’s less well known by users of other OSes because, unlike Thunderbird, it’s not multi-platform. It’s a groupware client, meaning besides email it can also handle contacts, notes, tasks, calendar. Evolution has been developed for more than 15 years in the GNOME project. It’s the default email client in Fedora. Who is it for? Evolution is an ideal solution for those who also want calendaring, task management, and other functions besides email. If you need to connect to an Exchange server, it’s probably the only reasonable option on Linux. Geary is the youngest client in this overview. The Yorba Foundation started developing it in 2012, and iIt’s now maintained by the GNOME Community. Geary has a modern interface which is focused on popular email services, mainly Gmail, and is inspired by them. For instance, it adopted the conversation view of Gmail. Who is it for? Do you use Gmail and would you like to try a desktop client? Geary is the closest desktop client to it. Geary does a good job focusing on the essential workflow, providing a mean to quickly sort through the inbox, and keep conversations grouped. While not perfect it does a reasonable job reusing the same patterns established in GNOME3. Difficult choices have been made. Somebody relying on POP/heavy client side filtering will be disappointed, but to me it’s the closest thing to calling a free software mail client elegant. Kmail is well-known mostly among KDE users, with a history almost as long as Evolution’s. It has lost some of its popularity recently, as seen on the poll results. Users complain about lagginess and high system requirements of the Akonadi backend. But Kmail also has advantages, since it has a lot of advanced features, and is easily extendable to a full-fledged groupware solution, Kontact. Who is it for? Do you use KDE Plasma and want complete control over email and setup for everything? Kmail is the best option for you. Well, first because it isn’t mandatory to setup Kmail in order to use Kontact. It is in Evolution. Second, because Kmail has a wizard that configures everything automatically fetching info from Mozilla. While it is a bit tricky on certain things it’s still handy. 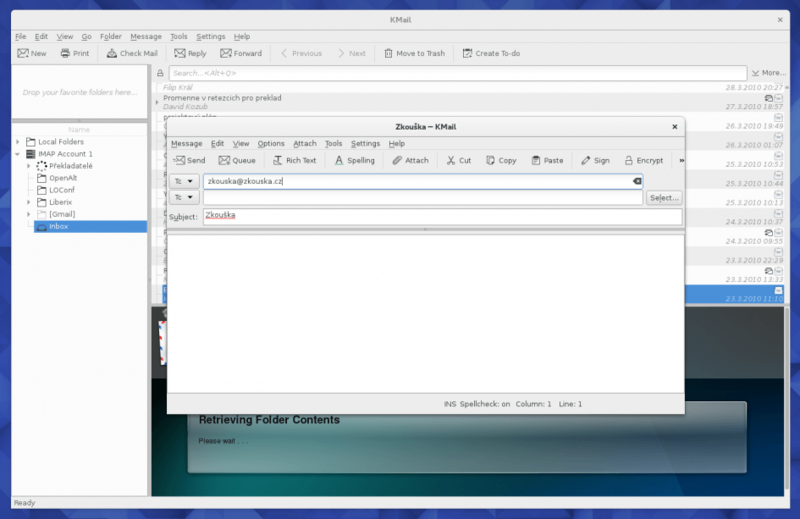 Third, Kmail integrates very well with other desktops; it’s not KDE exclusive. Fourth, because what I use more is the calendar/to-dos part. On that side I prefer by far Kontact because its Summary view. I can see everything at a glance and if there’s any new email I’ll see it there. Fifth, is less Outlook compatible oriented. Sixth, is more flexible and less intrusive. Mutt has been the most popular command-line email client among Linux users. But it’s not very friendly to novice users. The user base is generated mostly from power users who spend a lot of time in the terminal. You can navigate through Mutt using only the keyboard. You compose messages in an external editor, which is a big plus for users accustomed to effective command-line text editors such as Vim and Emacs. Who is it for? If you spend most of your computer time in the terminal, why use a graphical client? Mutt can do the same job with fewer resources and it’s configuration is virtually unlimited. 1) I come from a sysadmin background, where I lived in terminal windows. My FPL job doesn’t need that, but I kind of like to retain that connection. 2) I have extensive customizations, filters, scripts, and everything, which I’ve been using for… twenty years, since I stopped using elm. It’d be a pain to migrate all of those! 3) I actually use it directly on the server where I get my mail, and it can work with local mail folders directly, so no IMAP or anything like that to manage or worry about – and no synchronization problems. It’s the “cloud” advantage of access-from-anywhere, just like webmail – except a little more “texty”. 4) Since it’s a console tool, it integrates seamlessly with my preferred editor, joe. Claws Mail is an email client written in GTK+ that’s been a bit hidden in the shadow of Evolution. But it has a loyal community and user base it’s been serving for almost 15 years. It started as a fork of Sylpheed, which is also still alive, but Claws Mail has more active development and seemingly more users, too. Both are conservative desktop clients with lower system resource requirements, so they’re often used in Linux distributions for older computers. Who is it for? Do you still use email the same way like 15 years ago? You don’t understand how an email client can consume several hundred MB and still be slow? You will like Claws Mail. I like to think of it as a graphical Mutt. It’s nice and configurable, has good IMAP support. It just looks a like a good traditional mail client (it doesn’t try to simplify things and it doesn’t try to be flashy). I like the MH format (each mail message stored in its own file) it uses. Like Mutt, Alpine is a command-line client. It was created in 2007 as a replacement for Pine, whose development was stopped and whose license was changed to freeware. Who is it for? Do you also spend most of your computer time in the terminal, but Mutt is too complex for you? Try Alpine! This has been an overview of the most popular email clients among Fedora users. But it’s definitely not a complete list. Fedora offers other interesting alternatives. For instance, Trojitá, written in Qt, has very good and fast IMAP support, but has limited features. You can also use the email client in Seamonkey, which is a fork of Mozilla Suite. You can also try Sylpheed. Emacs fans should try Mu4e that is an email client based on Emacs using mu as a backend. N1 by Nylas brings an interesting approach: it moves most of the client logic to the server, and only runs a thin client locally. You won’t find N1 in Fedora repositories yet, but you can install it on Fedora. What email client do you use and why? I really wish Evolution would receive a major design overhaul, or Geary receive some updates that makes it work as well as on elementary OS. The difference between the elementary version and the Fedora version are actually quite big, I’m not able to add more than one account, or to search my mailbox (both of which is possible on elementary). The 2 issues you have mentioned are not here, I use Geary solely and it works perfectly. The issues for me are: RTL Support (Arabic Language) in messages, and Filters Support. I am also a KMail user. I have always been as long as I remember. There is nothing better than using email, contacts, calendar, journal, notes, and task in one fully integrated app like Kontact. KMail makes it super easy to create profiles to use one email or several aliases for different purposes. It also works seamlessly with GnuPG. Akonadi is the Systemd or Pulseaudio of KDE community. Social network ninja’s just like to throw things at it when there’s nothing better to do. From time to time Akonadi gives me headache, so I’m not a big fan of it. But I do love Kmail and Kontact. I like Evolution too but it lacks that Summary page where I can see everything at glance like Kontact, and it’s more Outlook/Exchange oriented. I’m actually one of the ~40% that uses webmail clients. I used to use Evolution and/or Thunderbird, but the amount of mail I get is so small that I can use a webmail client just fine for my needs. I don’t do advanced things with email anyway, so a full blown client like Evolution is overkill for my needs, but it’s good that it’s there for people that do require the power it offers. I used to use it at my old sysadmin job, because management required it and we used to do a lot more with email then I do right now. Again, good that we’ve got choice, right? I must reckon that %90 of my time I read and answer emails from web, whether mobile or laptop. But when my connection isn’t constant, I prefer to download everything when I’m on WiFi and then read/write offline. When I reach the WiFi again I send and receive everything again. And yeah, Evolution is more for enterprises or commerce offices or people who have to deal with Outlook or Microsoft things. It’s kinda too much to me too. I use Yahoo! Mail for personal e-mail. I’ve been using it since before GMail existed. I find it to be less complex, faster, and more dependable. Several times when I tried GMail it wasn’t working correctly and I find the current GMail cluttered and hard to use. When accessing work e-mail from my Fedora boxes, I use Outlook Web Access. Evolution is just too slow comparatively. Before the era of good web mail or GUI mail clients, I used Elm and Pine. Although I like those apps and I prefer their simplicity, viewing attachments was not easy. Yeah, Yahoo is often a source of spam. Same goes to Adinet (Uruguay), Hotmail and Montevideo COMM. I don’t like Yahoo, I actually read my yahoo stuff from Google. I don’t see Gmail cluttered, but I use simple HTML instead the standard view. Maybe that’s why. Good to know. I also wish their spam filter for incoming e-mail was better too. That’s a good insight into other email clients I’ve pretty much ignored. I’ve stuck with Thunderbird as I have used it for years with Windows too. Familiarity of the interface is the main reason and the fact it does everything I need within one package. With the bundling of Lightning these days it has become a decent alternative to Outlook. I prefer IMAP and Thunderbird is great at handling that. Having said that, I may take a closer look at Claws again which is one package I have blacklisted in my kickstart because I use Thunderbird instead at present. I don’t use Exchange so the support of it has never been an issue. I’ve also been using Thunderbird for a good many while. I switched to it from the Fedora default of Evolution and never looked back. not sure why this article has been re-published. anyhow, an update about claws. I now use it instead of Thunderbird and haven’t missed anything either. claws is easy enough to configure and can be tarted up a bit with appearance tweaks and icon sets so it doesn’t look too retro. I used gmail for a few yrs, but since moving to linux and trying to be more secure I have opted for startmail. Also use Ixquick/Startpage browser. I am the odd man out. I use webmail, (firefox for gmail and for yahoo). Much of my emails have embedded graphical images. With a click of the right mouse button, these embedded links open up in a second tab. With Tbird, Evolution, which I occasionally use, each embedded link appears to launch another version of firefox, or if FF is running, overwrites the existing page on display. When Tbird or Evolution could integrate the viewing of links, I will certainly move over. And the reason for so doing is for avoiding the onslaught of advertisements in sidebars and embedded within my views of web pages. In summary, its for convenience that a web browser suites my requirements better than the other email clients. I think Kmail configured to show HTML, images and external stuff works fine. The only thing is that you have to configure separately what browser is the default. If you’re in KDE. If you’re in any other desktop (I’m on Cinnamon) Kmail/Kontact simply follows desktop default. I would try Mutt if there was a decent primer on how to get started with it. Everything I have found for documentation is pretty obtuse. I like Thunderbird because it supports end to end encryption with the proper add on. I believe others on this list do as well? I use Opera mail. It has an easy setup, simple interface, is responsive and very stable. It provides excellent support for POP and IMAP accounts. It also handles RSS Feeds. It lacks read notification requests but that is a miner. For me Opera mail is an email client that I learned to like and love and have rolled it out to my clients on both Linux and Windows. To this date I often still do repairs on Outlook and other email clients issues, while accounts running on Opera is smooth and needs no further or constant support. I tried using KMail, but it simply just had too many issues. I have used Thunderbird as well, but Opera Mail’s Labeliing, filtering, search and display of messages is working better for me. SeaMonkey mail. Why? Because WHY NOT? It’s the grandfather of today’s email clients, originally being Netscape Mail, before Mozilla Suite. Plus, if I’m using the email client I’m also using the browser, so it just makes sense to use an email client that shares the browser engine with the web browser, instead of having two different HTML engines loaded in RAM to display the same kind of content (web pages and HTML email). SeaMonkey mail does the job, supports S/MIME and gets generally the same security fixes as the rest of the SeaMonkey suite and Gecko HTML engine from Firefox. Very useful. Question for Mathew Miller: what do you use for calendar? Or perhaps this could go into another article? I think Evolution is the best match for gnome desktop (primarily due to its calendar and desktop integration) but for the future with design overhaul: has to be more compact in terms of interface. 1) I’d like to know why the author thinks Thunderbird has better IMAP support than Evolution. Last time I looked this was not the case. One example: Evolution supports “correct” deletion of messages in the IMAP model (i.e. mark and expunge), while almost no other client does. (Full disclosure: I’m a moderator of the Evolution mailing list). 2) Desktop clients are superior to webmail in one key respect: support for mailing lists. Even though I have a Gmail account, I use it via Evolution for all the technical lists I’m on. Using a list via a webmail client is very limited and clunky in comparison. For example the Gmail web client doesn’t have a Reply to List function and it’s hard to avoid top-posting in replies (anathema for many list members). I’m guessing that mailing lists are the preferred discussion medium for most technical users (compared to web forums, Reddit etc.). This would explain why desktop clients are still popular in that community. About 1) From my personal experience Evolution works fine with IMAP in online mode. For usage with a notebook I would not recommend it, because syncing folders takes a very long time and sending messages written in offline mode seems unreliable. Even though I had to make some cutbacks I am using thunderbird with the eXquilla plugin now. I was using Geary happily until I read this piece. I did not know that development had stop or rather lapsed. I had actually contributed to the Yorba foundation, disappointed. This news drove me to check out some of the other email clients listed( I’m That Guy who needs an email client). Evolution was a bit better than a few years ago when I first looked into it. Looked again at the Seamonkey suite which I had used for several years circa 2007. Skipped over Kmail, thank you, I abandoned KDE in 2003. That brought me back to Thunderbird which I had used for several years but was displaced by Evolution, then Geary. That may be the best way. In the past, one could use sendmail to relay local mail to another mail server like gmail.com. But everyone shut off the relay feature because it was being used to send spam anonymously. Another way is to create a $HOME/.forward file containing an e-mail addresses that you want to forward to. However, e-mail servers may block this too. Geary development has been picked up by the ElementaryOS team, rebranding it Pantheon Mail. I have to admit, I’ve tried most of these and I still use the web client. I let Evolution do its thing in the background to sync my calendar but that’s about it. I’d be just as happy with a decent calendar app that alerted like Evolution. However I think I’ll have another go with Geary. I tried Evolution and was stymied trying to create a unified inbox. I get that some folks don’t want that feature, but not having an option to use one inbox is baffling to me. Right back to Thunderbird I went. I use Thunderbird because it’s probably the most powerful solution despite Mutt (and I do need HTML). However, for notifications I use Mailnag. It’s a nice sleek Python Gtk program that can also run as a daemon to notify you of new mail. There are a number of plugins available to play a sound, show a libnotify notification or detail the new messages via a separate Mailnag Gnome Shell extension. Very handy. Saves me from have to keep Thunderbird open all the time. I fork my mail to gmail (for reading HTML-formatted messages and on tablets) then it is downloaded for reading in mutt and for archiving in mbox format. What seals the deal with mutt for me is the ability to save a thread to a file in mbox format to a descriptively named file, the full pathname of which I then paste into my to-do list. When editing the to-do list with vim, I use a custom function to call up mutt from within the editor and directly respond to the thread, and the thread itself is already archived as a searchable file. That I am aware, none of the other options listed here let you save threads, in plain text mbox format, in arbitrary locations in the filesystem, where they can be called up and processed with just one keystroke from within my editor. I cannot imagine working without this. After using Evolution for a very long time I switched back to Thunderbird because Evolution kept killing itself with one specific shared IMAP mailbox. No idea what reason was. I really liked Evolution – the Google contacts integration via Gnome Contacts is really great! Besides that, a major pain with evolution was it’s strange undo capability when writing mails. It just didn’t work reliably – for important mail I started using a text editor instead. Because of this mailbox hickup I’m now on Thunderbird. This is so convenient when moving whole message threads into subfolders.